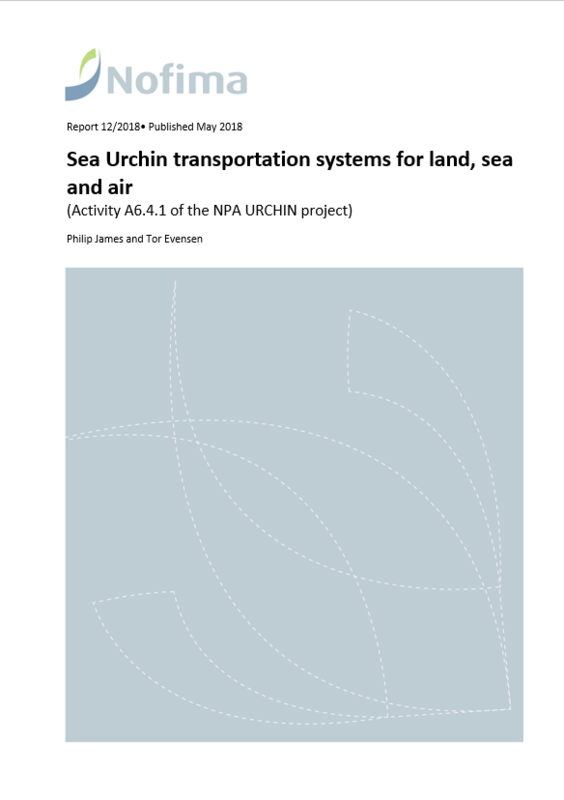 This report gives a brief introduction to the URCHIN project, funded by the Northern Peripheries and Arctic Programme (NPA) including the aims of this study. The authors recommend that the maximum period for transporting live sea urchins for use in subsequent roe enhancement trial, using the dry techniques described in this report would be between 14 and 44 hrs (depending on temperature). The results from the immersion transport trials show that transporting sea urchins in chilled, aerated seawater systems will be suitable for sea urchins for periods of at least 22 days. If ammonia-stripping (denitrifying) capacity is included into the transport system, then transportation times may be significantly longer. The average sea urchin unionized ammonia (UIA) production in chilled (6.6oC) and aerated seawater holding systems is 1.34625-5 kg urchins/day/litre. All sea urchins held in novel spray holding systems died within 4-5 days. Although spray-holding systems are effective for live holding of various species of shellfish the results of these short trials indicate that they are not suitable for live holding and transportation of sea urchins. If sea urchins are delivered alive and ready for processing or immediate consumption, then the airfreight packing techniques described in this report is sufficient for at least up to 44hrs transport. If sea urchins are required for storage in a holding system and remain alive for an extended period, then the techniques used in this trial are effective up to 34hrs transport. The following report gives a brief introduction to the URCHIN project, funded by the Northern Peripheries and Arctic Programme (NPA) including the aims of this study. The authors recommend that the maximum period for transporting live sea urchins for use in subsequent roe enhancement trial, using the dry techniques described in this report would be between 14 and 44 hrs (depending on temperature). The results from the immersion transport trials show that transporting sea urchins in chilled, aerated seawater systems will be suitable for sea urchins for periods of at least 22 days. If ammonia-stripping (denitrifying) capacity is included into the transport system, then transportation times may be significantly longer. The average sea urchin unionized ammonia (UIA) production in chilled (6.6oC) and aerated seawater holding systems is 1.34625-5 kg urchins/day/litre. All sea urchins held in novel spray holding systems died within 4-5 days. Although spray-holding systems are effective for live holding of various species of shellfish the results of these short trials indicate that they are not suitable for live holding and transportation of sea urchins. If sea urchins are delivered alive and ready for processing or immediate consumption, then the airfreight packing techniques described in this report is sufficient for at least up to 44hrs transport. If sea urchins are required for storage in a holding system and remain alive for an extended period, then the techniques used in this trial are effective up to 34hrs transport.